In the world of Kentucky agriculture, it doesn’t get much more traditional than tobacco and horses. The state leads the nation in burley and dark tobacco production while the equine industry ranks number one in horse sales. But more than that, the two have helped build the economy of Kentucky for many generations. The history of the state’s agriculture industry is built on its storied equine and tobacco sectors. Frank Penn knows this better than anyone and has been a part of both nearly all of his life. 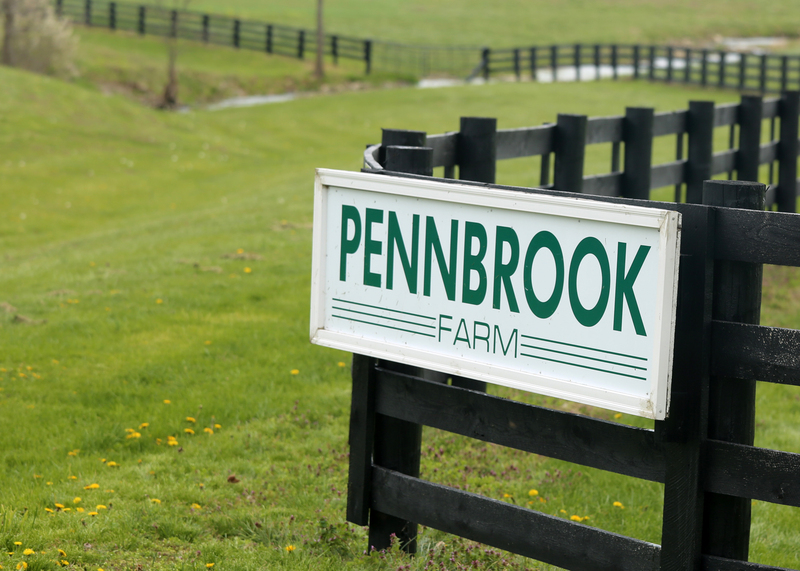 His Pennbrook Farm has served as a model of farm diversification before it became known as that, being a well-known thoroughbred boarding/breeding operation and once one of the largest tobacco farms in the burley belt. Frank Penn works with one of his Thoroughbreds at Keeneland. In addition to his farm, Penn is Vice President of Penn Brothers Storage and Co-Owner of Penn Sales, LLC. He has served as Director of the Kentucky Thoroughbred Association/Kentucky Thoroughbred Owners & Breeders, Inc., Trustee of Georgetown College, Vice-Chair of Lexington Fayette Urban County Government (LFUCG) Rural Land Management Board, Director and Past President of the Fayette County Farm Bureau, President of the Council for Burley Tobacco Agency and Director of the Lexington Chamber of Commerce. He is also involved with the Kentucky Farm Bureau (KFB) Equine Committee, the LFUCG Planning Commission and serves on the Ag Finance Corporation Board as well as the Kentucky Equine Education Project’s board as the KFB representative. Penn inherited the love of the burley and equine sectors from his father and continued since taking the helm of the farm in 1968. He even tried his hand at auctioneering back in the day when tobacco auctions were the way to get the product to market. While his voice wouldn’t hold up under the strain of auctioneering, Penn has remained active in the tobacco industry even though he no longer produces it. In speaking specifically to the horse business, Penn said he is in a high-risk, high-reward business and, for anyone who “has the stomach” for that, and truly loves the land and the animals, the equine industry could be for them. Penn certainly loves the land and the animals remaining on the farm his father bought. He said it is those family farms that make up the majority of the horse farm network in the overall tapestry of Kentucky agriculture. “We are still an agriculture state and I’m not afraid of the word ‘farmer’; it adequately describes who I am. Being a horseman is part of it and I want equine to be a part of agriculture. I think that’s extremely important,” he said. Penn added there are all types of breeds that make up the entire equine picture but the thoroughbreds are the recognized symbol of the state’s horse industry and there is much that can be done to market that industry to the public. In noting that thoroughbreds are the most recognized of the breeds by most people, Penn said all the breeds in the state are important to each other. “I don’t say thoroughbred industry very much; I say equine industry because we are to the point right now that we can’t survive without each other,” he said. Penn doesn’t shy away from being critical about equine issues or any concerns related to agriculture but always adds the caveat that it’s because the industry means so much to him. “Agriculture’s job in the next generation will be to prove that it’s true economic development,” he said. Many strides have been made to create more economic development opportunities over the last two decades with the investments made by way of the Kentucky Agricultural Development Fund and the Kentucky Proud marketing program. Penn said he pushed hard to get state bred horses added to the Kentucky Proud list and it was a great move for both the program and for the equine industry. In fact, the next step is to get the Kentucky Proud logo on every saddle of every stakes race in Kentucky. “That publicity is unbelievable and were just as proud of our horses and take just as good of care of them as the rest of the agriculture products,” he said. It doesn’t take a long conversation with Penn to realize how proud he is of his horses, his land, his family heritage and the state’s agriculture industry as a whole. Penn will admit that the burley tobacco industry has seen better days and is “limping along.” This growing season will mark the second in which he has not raised a crop. As contracts have shrunk, he said it’s not worth raising just a few acres. But the potential for the equine business is undoubtedly present in a state still known as the “Horse Capital of the World” as long as it doesn’t go back to being the “Sport of Kings,” he emphasized. As for the combination of horses and tobacco on the same farm, Penn never saw it as an usual combination. “I always thought the two did go together. We called it different streams of income!” he said.